This package is perfectly suited for long Thailand tour package, it covers tour of 04 most famous destinations Phuket- Krabi -Pattaya and Bangkok tour package, Starts with Phuket tour this island is home to several high-end seaside hotels, resorts, spas and restaurants. Phuket City, is the capital, has old shophouses and busy market place. next stop is Krabi which is the capital of the southern Thailand Krabi Province, it is a hotel and resort town near the Andaman coast. Other two destinations are Patttya and Bangkok which is visited by most of the visiter who visit Thailand for first time. The city is famous for its Portuguese style buildings and colorful markets, Wat Chalong, Rawai Beach, Sea Gypsy Village and Cape Promthep Later, spend the day at leisure or proceed to enjoy Phuket Fanta-Sea show(optional tour) in the evening. The Phuket Fanta-Sea has been billed as the ultimate cultural theme night park. After an appetizing breakfast, get ready for Phuket City Tour to explore the phantasmagoric beauties of Phuket. You may opt for tours to one of the nearby islands and beaches, top suggested options being Phi Phi Island and James Bond Island. Later spend the day at leisure and overnight stay at hotel. After breakfats you will be transferred to the Krabi resort, which is a 30 minutes scenic drive away. 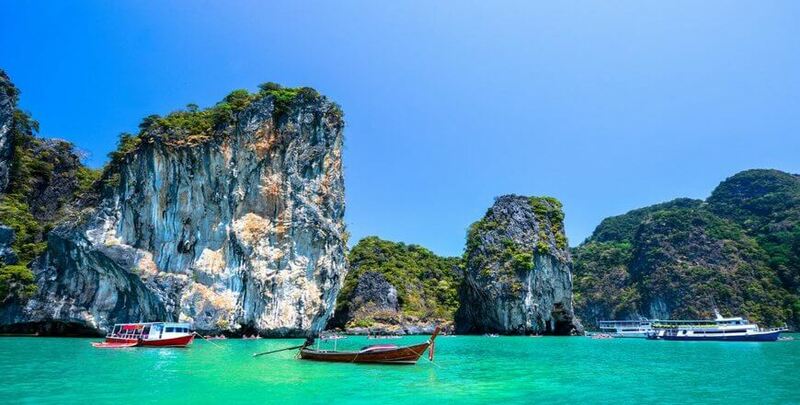 Krabi is heaven for beach lovers, with the Railay beach, Ao Nang beach, Hat Noppharat Thara and Phi Phi Island offering pristine sands, blue waters and adventure sports options. A favorite for couples and families alike, it is perfect to enjoy the sun and sand by Andaman Sea. Steep limestone cliffs at Railay beach offer a dramatic landscape and great adventure option for those interested in rock climbing. For dinner, you can head to one of the numerous restaurants on Ao Nang beach front shopping area. Enjoy a comfortable overnight stay in Krabi. Today, you will be transferred to the airport for departure to Bangkok, a short 80-minute flight. After arriving in the Thai capital, we will transfer you to the hotel. Thailand is home to more than 26,000 Wats (Buddhist temples) with Bangkok having some of the most distinguished Wats, such as Wat Po (temple of the Reclining Buddha) that is home to the breathtaking 43 metre long reclining Buddha.​ Take time out to visit the Grand Palace nearby, the erstwhile residence of Kings of Siam. On this day, you will be taken on a Coral Island Tour on speed boat with Indian lunch. Later, return to your hotel for a comfortable stay. On this day, you will get a private transfer from your hotel in Pattaya to your hotel in Bangkok. Once you have checked-in, spend the day indulging in an activity included in the package. Later, return to your hotel for a comfortable stay. On this day, indulge in breakfast at your hotel. In the evening, you will be taken for a dinner cruise on the Chao Phraya River. Once the activity is over, you will get a transfer back to your hotel for a comfortable stay. On this day, check-out from your hotel as per the hotel policies and plan your day according to the time of your flight. Once it is time for you to leave, you will get a private transfer from your hotel to the airport, for your flight back home. Page rendered in 0.0203 seconds.